Optimizing packaging performance requires fine-tuning of the entire product flow process—from the way product is distributed into the measuring system through to the filled, sealed, and cut bag or pouch. 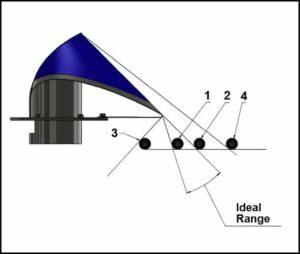 Symptoms of product flow issues on vertical baggers include downtime from product blockages and poor end seals and cutting problems due to product contamination of the sealing jaws and knife. Considered in isolation, as one-time incidents, each problem may only cause a relatively short period of downtime and a small amount of product and film waste. But when the cumulative impact of product flow issues is considered over time, the costs can mount. When product flow issues grow to be chronic, and their costs are recognized, running speeds are sometimes reduced to the threshold where problems no longer regularly occur. In these cases the resulting reduced output levels may become embedded; the presence of a potentially solvable problem is masked, and opportunities to achieve full potential for output and package quality can be missed. Varying thicknesses of film at the end seal can cause sealing problems, especially at the transition points of multiple film layers created by the fin or lap seal, gussets, wrinkles, creases, and at the corners. Applications of pressure and heat must be great enough to cause the sealant layer to flow into and seal off these voids. However, excess pressure can easily crush or split the end seal, while overheating distorts the seal and can cause poor hot tack, where the film springs back open, or “moons,” before the seal can set. The operating window for creating quality seals can be elusive, resulting in packages that leak, are distorted, and have little appeal to consumers. An important step in troubleshooting these issues is to eliminate unintended wrinkles and creases. 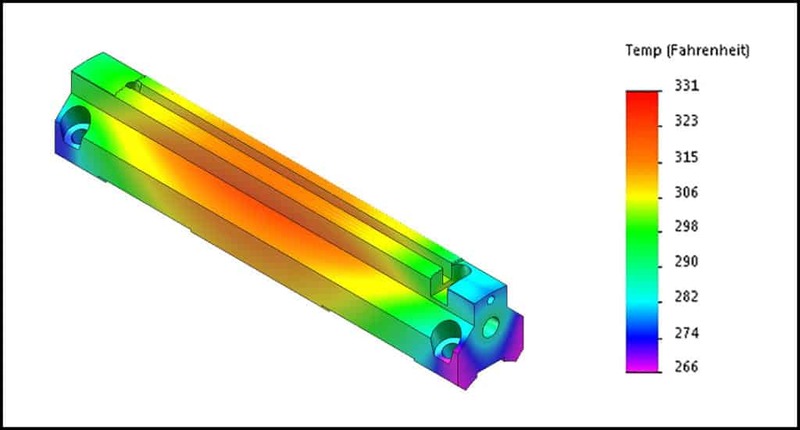 This post, the second in a four-part series, will examine this process on vertical baggers; Part 1 covered these issues on horizontal flow wrappers. 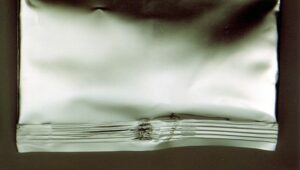 Any impediment that disturbs the even flow of film can distort packages and create leakers; a combination of factors is often to blame. To find the causes of these problems and fix them we recommend a comprehensive analysis of design, condition, and adjustment, beginning with the film roll and following along sequentially as the film is unwound, formed, filled, and sealed. The wing of the forming collar should completely and evenly support the film as the flat web is formed into a tube. Too much, too little, or uneven tension can cause wrinkles and creases. 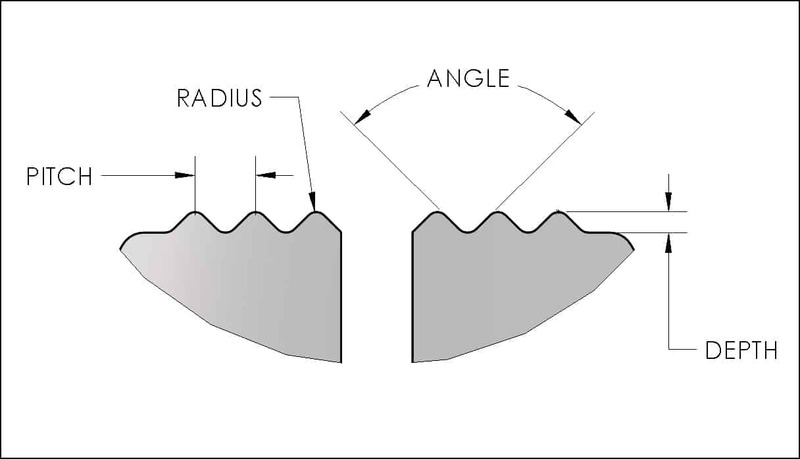 Varying thicknesses of film at the end seal can cause sealing problems, especially at the transition point between two and four layers created by the fin seal, gussets, wrinkles and creases, as well at the corners. Applications of pressure and heat (if applicable) must be great enough to cause the sealant layer to flow into and seal off these voids. Excess pressure can easily crush or split the end seal, while overheating distorts the seal and can cause poor hot tack, where the film springs back open, or “moons,” before the seal can set. An important step in troubleshooting these issues is to eliminate unintended wrinkles and creases. This post, the first in a four-part series, will examine this process on horizontal flow wrappers; Part 2 considers these issues on vertical baggers. Set-up procedures for knives and anvils can vary according to the make and model of the packaging machine, knife adjustment style, and other factors. There are, however, some general principles that make these adjustments more effective and efficient, reducing downtime and parts costs. 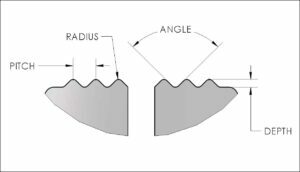 Knives ground on a diagonal, or bias–whether they have a zig zag or a straight cutting edge–require less pressure to cut so they are easier to set up and typically last longer. Zig zag knives with smaller (more) teeth are also easier to set up and provide longer life. Clearance and Pressure Adjustments required to create a good seal can impact the knife and anvil set-up. 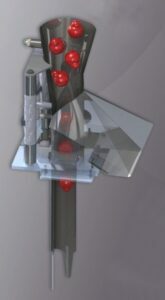 For heat seal applications, each packaging film structure has a Seal Initiation Temperature (SIT), at which the sealant layer is heated enough to flow into and seal off gaps in the end seal and provide a minimally acceptable seal, and a Maximum Temperature, beyond which the film distorts, fractures, or has inadequate hot tack (seal strength and integrity while the seal is still warm). The temperature range between the minimum and maximum is the film’s Operating Window. For a number of reasons, regulating heat is not as straightforward as simply adjusting the temperature setting within the operating window for the film you are running. 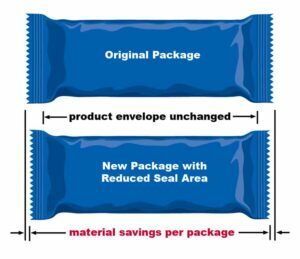 To reduce the cut-off length for each package by reducing the overall seal width, thus allowing the product envelope to remain unchanged. To achieve material savings without degrading seal integrity or productivity levels. To achieve a project payback period of twelve months or less. Even experienced users of forming sets can, over time, become conditioned to accept the hidden costs and preventable constraints of their packaging equipment. As with all waste, however, careful diagnosis of the root causes will lead to implementation of effective solutions. Greener Corporation has published a series of white papers devised to help optimize package quality and productivity on horizontal and vertical form fill seal packaging lines. In addition to helping you solve problems, these technical articles provide foundational information you can use to implement proactive improvements—an approach that helps deter problems from occurring in the first place.